Nearly a century and a half before the arrival of the world wide web, a guide written by H B Farnie working under the fitting nom de plume "A Keen Hand" was the first to offer instruction in the art of the game. The Golfer's Manual was published in 1857; surprisingly over 100 years after the first strokes were played by the Royal Burgess Golfing Society of Edinburgh. 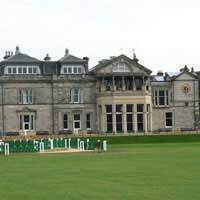 But it was the formation of the Honourable Company of Edinburgh Golfers in 1744 and a decade later the Royal and Ancient at St Andrews that really provided the impetus for a game that today attracts millions of viewers and players around the world. Using clubs fashioned from hazel, ash and beech a world away from the graphite and steel utilised by today's competitors, both amateur and professional, and hitting balls of goose feathers wrapped in horse or cow hide, these gentlemen players helped spread the popularity of the game First, south of the border, leading to the creation of the Royal Blackheath club in 1766, and then around the world to corners of the British Empire such as India, where the Calcutta Club was established in 1829, and Australia where the Australian, Adelaide and Melbourne clubs emerged in the latter years of that century. In 1860, the first of the modern-day "majors", the British Open Championship, came in to being at Prestwick. Across the Atlantic, the St Andrews Club in New York was formed at the end of the 1880s, precipitating the founding of the United States Golf Association in 1894 after Charles Blair Macdonald, runner-up in two separate national amateur championships that year, declared the need for one body that could set the standard for the game nationally under one single tournament. Macdonald's reward for his foresight came the following year when he won the first such tournament at the Newport club. Only the next day, the first US Open - another modern-day major - was staged, again at Newport, with Horace Rawlins receiving the honour of being the tournament's first champion. In the same year America's women made their mark on the history of the game when Lucy Barnes won the inaugural US Women's Amateur Championship at the Meadow Brook Club in Hempstead, New York State. The 20th century saw the creation of the modern game's two other major tournaments - the Masters and the PGA Championship - as well as the Ryder Cup and the Solheim Cup. Allied to this was the proliferation of both private and public courses across the world, mass production of equipment and the increasing popularity of the game driven by the media. It is little wonder that golf enters the new century as one of the most popular sports in the world. The late great American player Francis Ouimet is a textbook example of the game's rapid development in the past 100 years. Banned from competition by the United States Golf Association during the first world war for opening a sporting goods shop, Ouimet's commercial "misdemeanour" pales somewhat in significance compared to the millions of pounds in endorsements and image rights that are negotiated for today's generation.